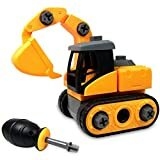 [Develop kids motor and imaging skills] with screwdriver(included in the package) in hand, your little kids can take the entire toy excavator apart by unscrewing piece after piece until there's nothing left but a pile of 18 parts, and easily put back together as many times as your kids want! The take apart toys work as educational toys that give little kids a real-deal build and learn experience, greatly develop their motor and imaging skills! [Guaranteed safe non-toxic materials] we choose Most safe materials to build the excavator toy since WisToyz considers safety first for kids toys. The toy vehicles are made of non-toxic materials that are safe and . [Outstanding long-last durability & perfect size for small hands] engineered to withstand those inevitable drops, bumps and bruises, this assembly toy are durable for long-last playing. In addition, this construction toy considers ergonomics when designing for little hands to grasp. [Truly unique gift for kids aged 2, 3, 4, 5, 6] this Take apart construction toy is a fun and unique gift for the children at heart! It is amusing but not complicated. Ideal toys for toddlers! Surprise them at Christmas! [Happy customers!] We are committed to serving customers with reliable quality toddler toys, WisToyz continues to deliver the best user experience with innovative technology from a TRUSTED brand. What's more, you get a 3-year warranty and 1-year money back guarantee for your investment. Please feel free to Contact us if you have any request, we will solve your problem within 24 hours!